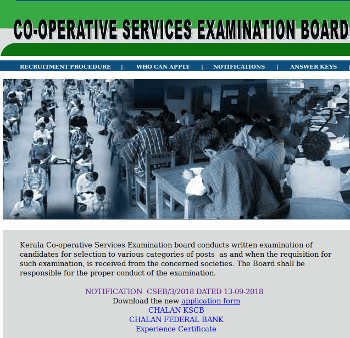 Kerala Co-operative services examination board (CSEB Kerala) has issued the new notification (Gazette Date : 13.9.2018) for recruitment to the post of Junior Clerks, Secretary, System Administrator, Data Entry Operator and Typist. 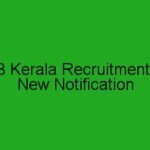 CSEB New Notification and Application Form can be downloaded from www.csebkerala.org. Last date for receipt of Application is 16/10/2018, 5:00 PM. Eligible candidates may apply in the prescribed application format – Download CSEB Application Form on or before October 16th, 2018, 5:00 PM. More details are given below. CSEB Application Form and chelan will be available from www.csebkerala.org. Candidates must apply through this prescribed application format. Candidates remit the application fee (refer fee details on notification) in any of the federal bank branches using the fee remittance chelan from the website (or using Demand Draft). Candidates should send the filled application form, chalan receipt / Demand Draft and self attested copies of all required Certificates/Documents to the following address on or before 16-10-2018 (5.00 PM).